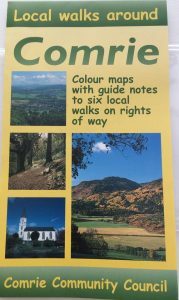 Comrie Community Council are please to announce that we have our new updated ‘Comrie Walks’ Maps available in locations around the village. The maps come with a handy plastic pocket and are in sale at £4.00 each. This gives profits to both the Community Council and the outlet. We would like to acknowledge the help we received from local resident Felicity Martin who was instrumental in ensuring the map trails were correct and adjusted which saved hundreds of pounds – Thank you Felicity ! 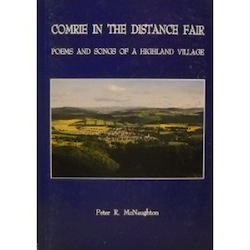 Four volumes that make up the series Experience Big Tree Country: 12 walks around Perthshire written by local resident Felicity Martin and published by Catkin Press. This series is designed to bring together the 48 best walks in the area. The easy-to-follow guides combine clear descriptions and maps with fascinating facts to reveal what makes ‘Perthshire Big Tree Country’ so special. Fact boxes about highlight the special natural and historic features that can be seen along the way, ranging from bluebell woods and thundering waterfalls to castles and wildlife reserves. The set is available at a discount here.